The entire Encourage The Young Women Bible study is now available as a book! This is part 11 in a series on the Proverbs 31 Woman. Perhaps the greatest difficulty in understanding this verse is in the unfamiliarity of the objects mentioned: the distaff and spindle. Most of us may recall Sleeping Beauty who, in accordance with a curse, pricked her finger on a spindle of a spinning wheel. That might give us some indication that a spindle is a long pointed object used for spinning yarn. But what about a distaff? What is that? 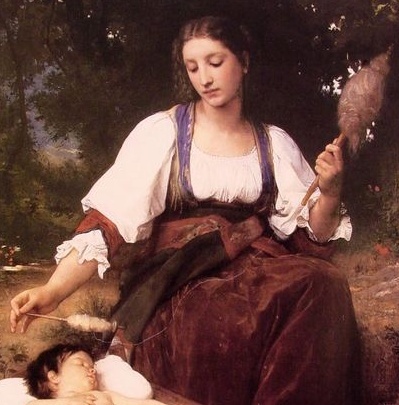 The following is from a painting entitled “Lullaby” by William Adolphe Bougeureau (1825-1905). It was painted in 1875 and shows how the spindle and distaff were used. In the lower left corner is the spindle. The yarn she has spun is wound around it. In the upper right is the distaff. The distaff holds the unspun fiber, commonly flax, because the flax fibers are very long and difficult to control. Flax yarn is called linen. We first saw the Proverbs 31 Woman’s interest in the textile arts when we looked at verse 13. Now we learn what she delights in doing, spinning her wool and flax into yarn. Her yarns are used to make various fabrics for her home and family (verses 21 and 22), and to sell (verse 24). While this may not be profoundly spiritual, I think it points to an important principle. There is an error in modern Christian thinking regarding how we judge one another’s spirituality. There is a human tendency to want to classify our activities according to one of two categories: spiritual or secular. We believe that what is done at and for the church (preaching, teaching, ushering, tithing, visitation, VBS, nursery duty, etc. ), is more important than what we do elsewhere. Consequently, we tend to judge others’ spirituality by how much time they spend at church, and we esteem church ministry careers as more important than so called secular careers. But is that how God views things? I say no. Why? Because God did not create a body of believers first, He created a couple: husband and wife, to whom He gave stewardship of the earth. While the church is the community of believers, the basic spiritual unit is husband and wife. This is this significant because we need to understand that our day to day activities are how we truly live out our faith. Our testimony to the world is in how we live our lives outside the church, not how many time we go to church. The church’s impact on the world is not in how many folks attended last week, but in the influence its membership has on the community in their day to day living. In reading Proverbs 31:10-31, we see this spiritual principle given as fact. Nowhere do we see a list of the Excellent Woman’s religious activities. Why not? Because her most powerful ministry is to her family and home. Excellent – Strong’s 2428 – חיל – chayil = a force, whether of men, means, or other resources. To be firm, or strong. An army, wealth, virtue, valor, might, strength, power. God’s inspired, inerrant Word describes an excellent and perfect wife as a homemaker, not as a leader in the church. Why? Because her God-given ministry is her family and home. It is the woman who sets the tone in the home and thus influences her entire household. She creates a stable refuge from the pressures of the world for her husband and children, and she uses her spiritual gifts to train and mature the next generation to impact the world for Christ. Sadly, we are in a day and age where the home is no longer the center and stability of family life. Instead, it has become merely an investment. Consequently, it is just a place to keep one’s personal possessions, collect one’s mail, and get a few hours of sleep and a quick bite to eat before rushing off to work, church, school, football practice, piano lessons, ballet rehearsal, garden club, etc. Many women joke that they aren’t domestically inclined because they don’t know how to sew on a button, or that they could burn even water. However, the excellent qualities of the Proverbs 31 Woman are learned skills. She started at the same skill level that all women do, but she learned and developed what she learned to a master skill level. Are we not capable of doing the same? My exhortation to Christian women today is to set aside the world’s wild goose chase to find “fulfillment” elsewhere, and to endeavor to see the ministry to their families as the most valuable ministry of all. Thank you for sharing this profound and Godly wisdom with us and for explaining our roles as women and wives so beautifully.